Not only do Virgin Experience Days make great rewards, but they make great prizes too! On pack promotions are a great way to get a Virgin splash on your merchandise, and give sales a pop with some unique giveaways. On-pack promotions are giveaways and competitions that involve buying a product with competition info printed on it. From there, the purchaser will usually need to enter a code found on (or in) the pack on a special site for competition entry, discounts or even instant wins (if your company's feeling particularly generous!). Your product receives a bump in sales from people buying to win prizes, and we can track for you which products have been bought/redeemed the most to help you tailor your future promotions too (such as only promoting certain product lines, or offering different prizes on different products). We can even help with fulfilment, as any products bought with a discount via your products will be automatically sent out to the redeemer without you needing to get involved, saving you time and admin effort. With the Kinder Bueno brand name on the rise (growing at +7.3% according to some Nielson ratings), Kinder chose to capitalise on their successes by offering some brilliant prizes to their consumers via Virgin Experience Days. The principle was simple: consumers buy a Kinder Bueno Classic (single or multipack) or Kinder Bueno White (singles only), enter a code they'll find on the wrapper at Kinder Bueno's site, and they'd be notified immediately if they're a winner. There were thousands of Virgin Experience Days Gift Cards to be won with a face value of £100, meaning a whole world of experiences for one or two available to every lucky winner. There was also a 20% off offer on Virgin Experience Days for every purchaser, so everyone could walk away feeling even happier than a chocolate bar makes them. Through the competition, even more people could try flying a helicopter, riding a jet ski, dining on a 5-star meal made by a celebrity chef, driving a supercar and more, with thousands of people getting to try the experience for nothing more than the cost of a Kinder Bueno. The tagline, 'Win a bit of different', was born from the idea that consumers within a specific market segment (which fits both Virgin Experience Days and Kinder Bueno consumers, women aged 20-35) are aiming to be a bit more adventurous in life these days. With a little bit of delicious chocolate, we helped them realise those aspirations. "We know that Kinder Bueno shoppers are always looking to try something different and aim to be more adventurous in life, and the Kinder Bueno promotion aims to give shoppers exactly that. 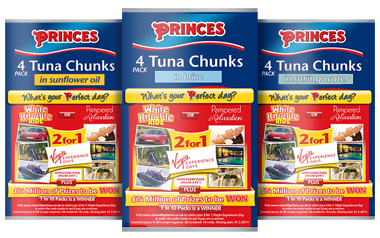 By offering shoppers the chance to win and enjoy a Virgin Experience Day of their choice, we aim to appeal to new and existing brand fans, whilst also increasing the brand’s visibility on-shelf and encouraging trial of this great tasting product"
When Princes were looking to up their tuna sales and increase store interest, Virgin Experience Days were their brand of choice to get people talking. As part of the Perfect Day promotion, 2.5 million canned tuna four packs included a unique code for shoppers to take advantage of 2 for 1 deals on Virgin Experience Days activities including Go Karting and Paintballing. Shoppers who used the code were also entered into a prize draw to win up to £250 Virgin Experience Days vouchers and money off Princes products. The promotion created in store interest for tuna and helped drive sales across the fish range. If you're looking to offer something exceptional during your next promotional giveaway, give us a call on 0844 272 0002 or email us at Contact@Virginincentives.co.uk to find out what we can offer you to catch your customers' attention.